Design online wedding eCards for your Save-the-Date, Invitations, and Thank-You notes...or customize any one of these to create your own occasion! Our custom eCards can match the color scheme of your personal wedding website or any other event colors, is fully customizable, and available in a variety of styles. With WedShare's eCard Designer, you have full control over your stationery's fonts, images, colors, and content. eCards for wedding invitations are also integrated with your Event Manager, so invitation recipients can click a link on their eCard to go straight to your wedding website's Online RSVP page and submit their RSVP response. 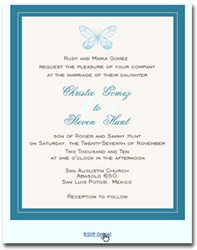 Create, send, and track online wedding stationery in ways never before possible. Match you wedding website with custom eCards! Your WedShare personal wedding website comes integrated with a complete eCard Designer, enabling you to easily and quickly create beautiful eCards that match your wedding's style and colors. Create matching Save-the-Dates, Invitations and Thank You eCards! Font types can be changed anytime using our extensive font library. Changing font colors and eCard template colors is easy using our palette and color mixer tool, so you can customize your eCards to match all your needs. All design imagery can be selected from our large library, or you can upload your own. Design embellishments and artwork can be swapped and uploaded, too! Invitations can link directly to your online RSVP page. When guests view their invitation, an easy single click-to-RSVP feature allows them to immediately respond to the event. Because the Invitation eCard handles authentication behind the scenes, your guest is never bothered with the need to enter in a password or other identification in order to submit their wedding RSVP. Event responses are all managed and tracked in your Event Manager, so you can see your headcount in real-time. 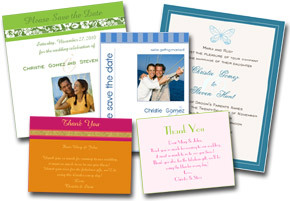 By default, your e-Stationery will match your wedding website's style and colors, often even imagery details. Everything can be designed, however, to suit your needs and preferences. Customizing e-Stationery is a snap with our point-and-click AJAX design interface. 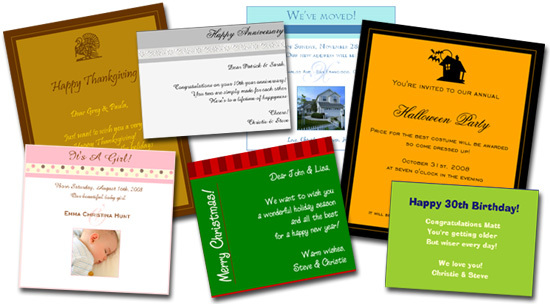 Create and send e-cards for engagement or marriage announcements, bridal shower and bachelor/ette party invitations, holiday greetings, party invitations, birthday and anniversary wishes, moving announcements, baby and other special announcements. The possibilities are endless!